Our methodology promotes a result-driven interactive approach and better customer service with quality. We take the approach of developing each and every module separately using the RAD (Rapid Application Development) methodology, so that, the application will be developed at fast turnaround time and with very few possible errors at first stage. Approach for Design and Development at Clipper Byte Solutions. We follow a structured framework and well-defined development Methodology. To improve the quality of development and managing complex development is about utilization of resources, accurate estimation of budgets and timelines, experienced selection of appropriate technologies, and scheduling feature development to meet time-to-market requirements. Our Project Management Process includes Project Planning, Project Monitoring & Control, and Integrated Project Management processes. Requirements Analysis is the process of understanding the customer needs and expectations from a proposed system or application and is a well-defined stage in the Software Development Life Cycle model. Requirements are a description of how a system should behave or a description of system properties or attributes. It can alternatively be a statement of ‘what’ an application is expected to do. 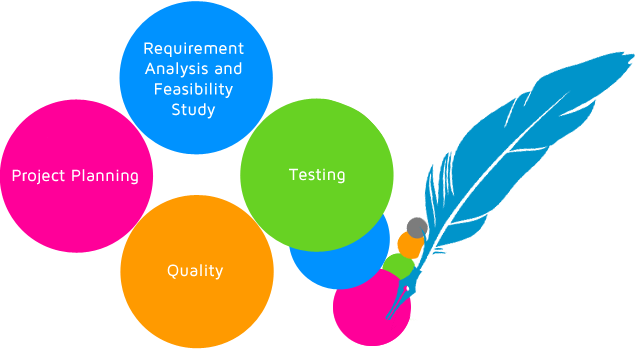 This process is also known as feasibility study. By the end of the feasibility study, the team furnishes a document that holds the different specific recommendations for the system. Planning is an aspect of Project Management, which comprises of various processes. The aim of these processes is to ensure that the Project tasks are well coordinated and they meet the objectives including timely completion of the project. Our testing plan includes integration and system testing. The test process includes all the test that cover functionality, error handling, performance, scalability, fail over and other required tests. We are using standard process of tests which perform a feature-by-feature validation of behavior, using a wide range of normal and erroneous input data. This involves testing of the product's user interface, APIs, database management, security, installation. Once testing process has completed and all issues are resolved, the project is released to customer for Approval Testing. We at Clipper Byte Solutions are committed to deliver Quality goods in stipulated time as per the specifications given by the customers. We would always endeavor for increased productivity and cost reduction through continual innovation in overall functioning of the company through team work. Our dedicated quality departments take care to ensure that the project we build satisfies our client's requirements. Our quality team work independently from development team yet in close cooperation with it.